20 years after its original release, one can’t help but see the influence of Luc Besson’s creation over films like Guardians of the Galaxy, where humor and silliness are replacements for the kind of self-important drama that too often feels at odds with the context of a sci-fi or an adventure film. Given such silliness, it is easy for a lot of people to dismiss The Fifth Element to B-movie status. However, the humor, which borders on slapstick, is well timed and well written. Luc Besson crafted an adventure film that also feels like a satire to the kind of action and sci-fi films that came out during the 1980s and 90s (The Terminator, Demolition Man, Point Break, Speed, etc) borrowing elements from them, but with a rather unique delivery. Though The Fifth Element set a precedent for sci-fi and fantasy films to allow themselves to be funny and lighthearted (which is something that was followed soon after with Men in Black), the film is not totally immune to typical “Hollywoodesque” concerns. After all, the story is driven forward by an intense romance that develops between two strangers in the space of 2 or 3 days; one a recently divorced, failed cab driver and former Army Major, Korben Dallas (Bruce Willis at his most blonde), and the other a beautiful redheaded “supreme being” from another planet named Leeloo (the model Milla Jovovich in a once-in-a-lifetime role). As appropriate as the two lead casting choices are, The Fifth Element has developed a cult following because of the dystopian universe it created and the varied ensemble of characters that inhabit it: Father Vito Cornelius (a fantastic Ian Holm) is a “priest of the light”, whose devotion to stopping “absolute evil” is only matched by his incapacity to be the hero the story needs. About halfway through we meet Ruby Rhod (a perfect Chris Tucker in his best ever role), an eccentric radio DJ whose rapid fire and flamboyant nonsense is exactly the perfect comedic fold to Korben’s purposely macho and introspective hero. General Munro (an inspired Brian James) is the sort of military leader better fit to lead boy scouts rather than being tasked to protect Earth from a fast-approaching meteor-like evil. Giving orders and generally looking stressed is President Lindbergh (Tommy Lister). 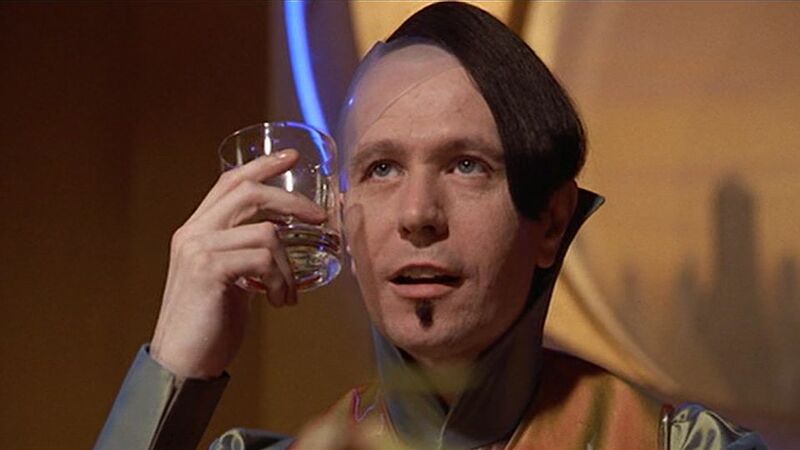 Last but not least is Jean-Baptiste Zorg (a delightful Gary Oldman), a larger-than-life villain with a limp, a peculiar plastic head piece and a long colorful coat that seems to have come in contact with a rainbow. He is, unsurprisingly, the life of the party, stealing every single scene and making The Fifth Element unique and so incredibly fun. In an age when Hollywood churns out superhero movie after superhero movie with 2 or 3 developed characters at most, and 2 or 3 action sequences worth remembering; The Fifth Element is the kind of overabundant action film that, without the tasteful touch of a capable director and the artistry of some of the designers involved (the famed fashion designer Jean Paul Gaultier among them), would succumb to the many parts it tries to juggle. If anything, the film is an exercise in designed and controlled chaos. 20 years after its release The Fifth Element still stands tall in a category of its own making, sharing more in common with a Studio Ghibli film in its character and construction than with linear and straightforward action films, new and old.